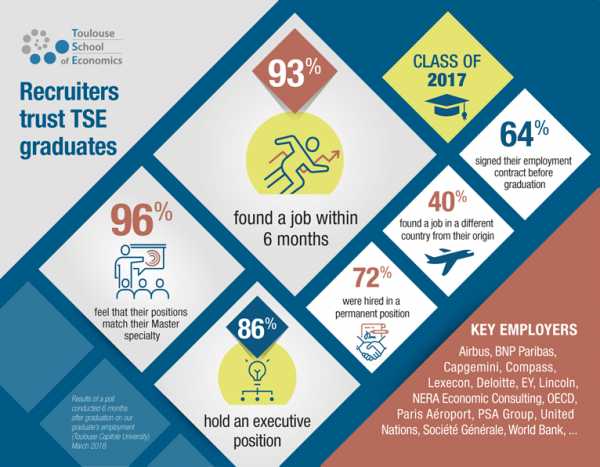 Preparing our students for their future careers and strengthening our relationships with business and policy communities is of primary importance to TSE. Offering guidance and support is also fundamental in career development to help students learn, grow and build skills in a challenging job market. Speak to our students during our "careers Talks"
Participate in our recruitment fair : "Busines Networking Day"
Go and meet the careers service, take advantage of the business opportunities offered by the school. Don't hesitate to contact the careers service for further information: careers@tse-fr.eu ! All internships are subject to an agreement between the intern, the organization receiving them and the university. This agreement must be signed 3 weeks before the start of the placement. The internship must have a learning objective recognised by the institution, whether or not it is integrated in the curriculum. Information for students is also available to help them go through the internship process. TSE organizes each November in Toulouse its annual careers forum, a unique opportunity for students to discover jobs and internship opportunities, and talk with potential recruiters from both policy and industry. We also welcome at the event a number of TSE alumni now working in international firms and institutions, looking to recruit TSE students and ready to share their career path experiences. Registration is already open: click here to register! Please contact careers@tse-fr.eu for further information. During the academic year, TSE organizes special lectures by professionals, called “business talks”, or by researchers, called “academic talks” to develop the economic culture of our students and help them built their future career plans. We also offer our students three public lectures per year given by renowned international social scientists,in collaboration with the interdisciplinary research institute IAST (Institute for Advanced Study in Toulouse). Most current jobs: economists, analysts, statistical research managers, consultants, or researchers.